From the Shadowlands in the south to the Burning Sands in the north, from the Twilight Mountains in the west to the Islands of Spice and Silk in the east, Rokugan, the Emerald Empire, has stood for over one thousand years thanks to the seven Great Clans who serve the Emperor. As guardians and politicians, each clan fulfills their role in society and they are as varied as they are powerful. But all are bound by the same code of honor, the way of the warrior, the code of Bushidō. Honor is valued above all else, and a misspoken remark can be just as fatal as an enemy’s blade. Enter the Emerald Empire. 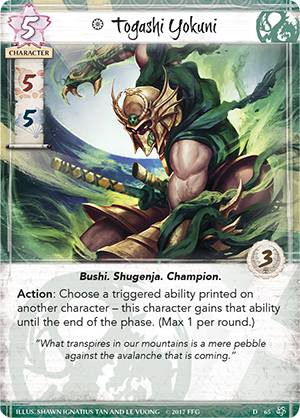 Legend of the Five Rings: The Card Game is available now! 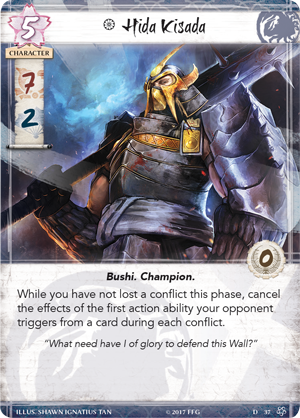 The world of Rokugan expands before you with the new Living Card Game® of honor and steel. Choose your Great Clan and overrun your opponent’s provinces through military and political strength. 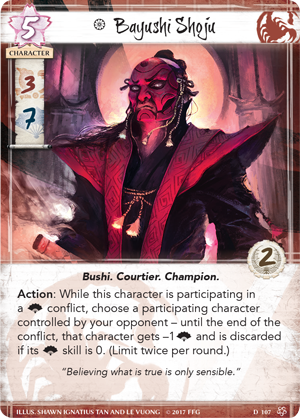 Every game of Legend of the Five Rings: The Card Game sees two players vie for superiority on the battlefield and in court. The first to overrun their opponent’s stronghold—through military or political means—claims victory. 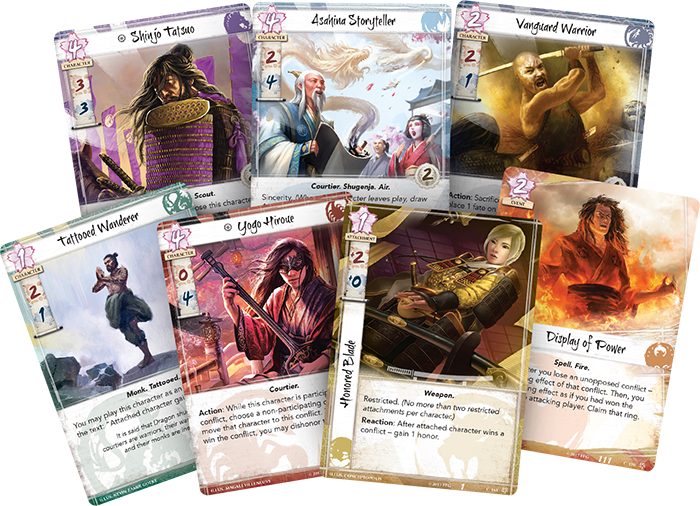 A round of Legend of the Five Rings: The Card Game begins with the dynasty and draw phases, in which the clans recruit characters from their provinces for the purposes of war or political intrigue. We also introduced the game's fate mechanic, which is not only used to deploy characters but also determines how long those characters will be on the field. After characters are recruited, players prepare for any eventuality by bidding their clan's honor in order to draw more cards. Next, we looked at the second half of a turn, in which the clans engage in conflict. Players take turns attacking one another’s provinces through military and political might. A game of Legend of the Five Rings ends when three of a player’s provinces are broken, and their stronghold is overrun. 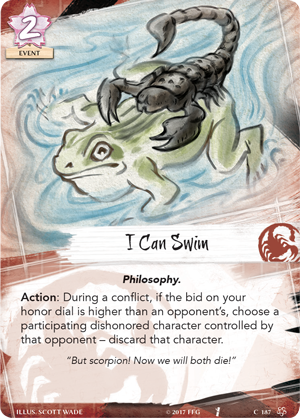 The most important choice you’ll make in Legend of the Five Rings: The Card Game is your clan. The seven Great Clans of Rokugan are all different: mechanically, philosophically, and thematically, and each provides a completely different play experience. The Lion Clan serve as the Right Hand of the Emperor, supplementing their military might with honor and tradition. 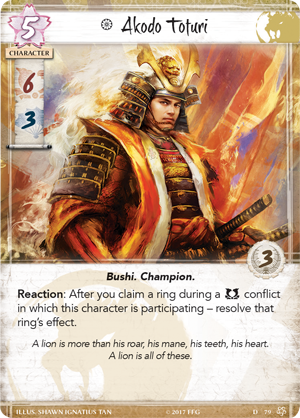 As such, the Lion Clan heavily favors military conflicts and can bring characters and attachments back from your discard piles with their focus on tradition and history. The Dragon Clan watches over Rokugan as mysterious monks in the mountains to the north. As seekers of enlightenment, the Dragon Clan interact with the rings of Rokugan in mysterious ways and strike a balance between military and political skill. Meanwhile, to the south, the Crab defend the massive Kaiu wall from the monstrosities that reside in the dread Shadowlands. With no need for honor or glory, the Crab dutifully protect the Emerald Empire, though the citizens of Rokugan will never know how much the Crab sacrifice in the name of safety. The Crab excel when defending, and are willing to sacrifice their own warriors and courtiers for powerful effects. Over 700 years ago, the Ki-Rin Clan left Rokugan to investigate external threats. After centuries of exploration and intermingling with foreign cultures, the clan returned to Rokugan as strangers in their own lands, renamed the Unicorn Clan. 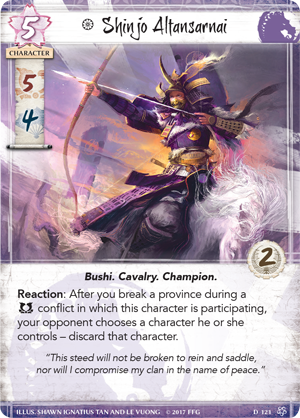 The Unicorn’s affinity for horses and strange magic are used to gain momentum over their foes in a game of Legend of the Five Rings: The Card Game. While the Lion represent the Right Hand of the Emperor, the Crane represent the left. Artisans and poets, the Crane are the pinnacle of perfection in Rokugan, always setting trends and speaking with grace unmatched. In political conflicts, the Crane dominate their opposition and win with a fluid style. As caretakers of the elements, the mystical Phoenix Clan fill the important role of guarding the Emperor’s soul. Delving into the mysteries of the spirit, what some would call arrogance the Phoenix call wisdom. Wielding powerful spells and high glory values, the Phoenix can overwhelm their opponents with a mix of military and political might. The Scorpion Clan serve as the underhand of the Emperor, dirtying their hands to keep Rokugan safe, no matter the cost to their own honor. The Scorpion do what must be done, and as such, they earn the ire of the other clans. Dishonor and underhanded tactics are the weapons of the Scorpion, and their foes must be wary of attacks from all angles. 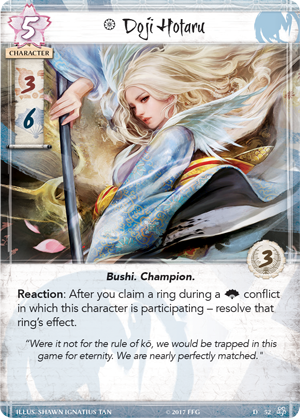 It’s been a long journey into Rokugan, but now, you can enter the land of honor and steel with Legend of the Five Rings: The Card Game. When the Great Clans face off, what side will you choose? Do you have what it takes to emerge victorius? Make your choice and pick up your copy of Legend of the Five Rings: The Card Game (L5C01) from your local retailer today! 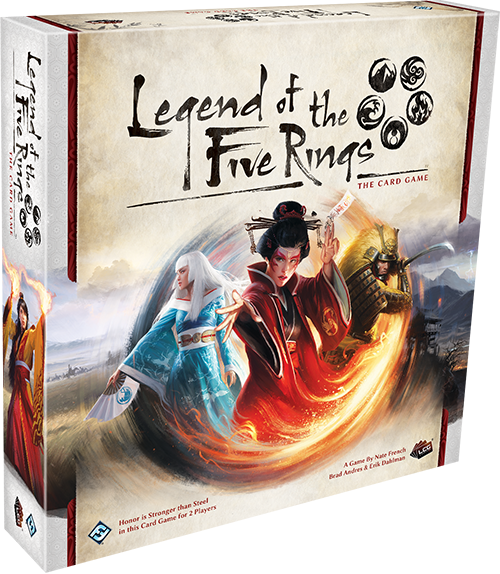 Legend of the Five Rings is a Living Card Game® that invites players to journey to the mythical land of Rokugan. 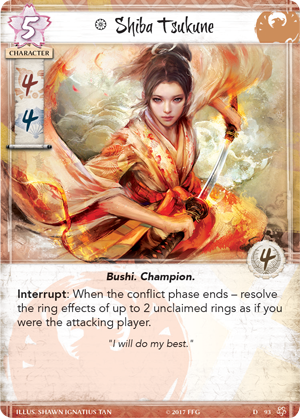 Although the LCG version of Legend of the Five Rings has significant mechanical differences from previous versions, it is fully our intention to maintain the spirit and emotional impact that’s so inherent to the setting.